Bates Jet MLS allows you to buy the best jet aircraft at the best price. You'll be able to view all available aircraft within any market sector in an online showcase we build for you right here at Bates Jet. Due to our relationships with financial and private equity firms, our access to capital is unprecedented. Consequently, not only can we source the best aircraft in the market, we have the ability to provide financing or structured leasing to customers. Bates Jet will ensure your rights are protected in acquiring new aircraft. We'll make sure your aircraft will be completed and delivered to your satisfaction. You will enjoy the lease or finance program we design for you to lower your costs of ownership. For previously enjoyed aircraft, our market research department focuses on knowing about all available aircraft so that you can make an informed buying decision. Bates Jet prides itself in completing acquisitions that bring much value to the table that ensures your acquisition is the right choice. The purpose of this Web site and related services is to put all information on one link so that you can see the entire market meeting your buying needs. Bates Jet MLS goes beyond hiring a broker with limited market research capability or relying upon those with little access to jet owners directly. Although we recommend having your own people involved, we complement those individuals in supporting the overall effort to secure the best aircraft at the best value. Bates Jet supports your aviation department decision making. Please contact Bates Jet to learn more about our acquisition services supported via comprehensive market research. Why competent market research is imperative when buying multi-million dollar aircraft. In the early 80's Bates Jet's principals pioneered providing buyers with aircraft market research services. At the same time the number of aircraft brokers exploded. Since most brokers did not do market research themselves several research firms began selling market data to brokers. Soon there was a robust industry providing brokers information. Many jet buyers have the impression that all brokers work from the same database. Not True. Now that the Internet is flourishing, and information is abound, many buyers also believe they can learn about all available aircraft by surfing the web. Not true either. Our experience shows, and our work clearly demonstrates, that resting a buying decision on one of these quasi listing services, or a broker who buys research data and who does not conduct market research themselves is not a wise choice. 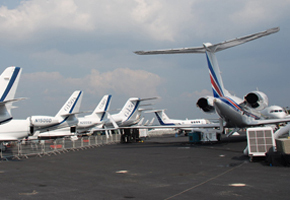 Reason: we've located aircraft for buyers where their acquisition broker could not find the aircraft. The broker simply relied on data they bought from the quasi listing service without any back up research. Instead the broker promoted an aircraft we too knew about but neither the buyer or their broker knew about the jet we found via our research. All this was based upon what the jet buyer told us they were looking for directly. Fortunately, we kept the client from buying at too high a price for a year older aircraft. Trusting their broker would have proven a disaster. The buyer was not too happy about having to pay his broker either for work they never did—work that we completed by doing our own research meeting the buyer's needs. With over 30 years experience in this business, and as aircraft buyers ourselves, a dedicated market research project is imperative in making informed aircraft acquisition decisions, With aircraft values in the millions, buying the wrong aircraft could result in hundreds of thousands of dollars loss in equity, if not millions. Hiring Bates Jet as your acquisition agent ensures you have all the information you need. Also, if Bates Jet is financing the aircraft as well as completing the acquisition, we're going to reduce risks, including our own, by ensuring you're not paying more than you should pay for aircraft.